Intel has released a totally new type of hard drive designed for faster boot times and storage. People in the market for a new hard drive may consider this technology, but before making any big investments, you need to know the full capabilities of Optane SSD. Below is our review of Intel’s newest storage device. Intel’s new standalone drive maximizes storage performance and can also serve as extra RAM for your servers. The Optane SSD DV P4800X has 375 GB of space, a data read latency of 10 microseconds, and data transfer rates (or throughput) of 2GB per second. With these specs, Intel claims users will experience faster boot times, quicker application load times, and 30% faster system performance. All of this makes the Optane SSD perfect for hosting machine learning and analytics. Also, if your company is involved in high-performance computing, Intel’s new RAM/storage drive should be high on your company’s wish list. Optane SSD, however, may not be the best for everyone. First of all, the latest storage drive is meant for servers. Another downside is that the 375-GB SSD is a hefty $1,520 — almost as much as deploying your own in-house server would cost! In this case, you would probably get more value out of a conventional SSD. Consumer-level SSDs still provide fast software boot times, but will probably offer less storage space and throughput rates than the Optane SSD. This really isn’t much of a sacrifice, considering that plenty of users can afford and work with 128 GB of ‘normal’ SSD storage. In fact, a 128-GB SSD can go for as low as $50. Your other choice would be the standard hard disk drive (HDD). Though these storage devices are far more common and much less expensive than the previous two, HDDs are slow to boot, noisy, and susceptible to hardware damage and data loss. The only thing going for the traditional hard drive is its storage capacity. For $50 dollars, users can buy a 1-TB hard disk drive. Although HDD may not be ideal in terms of speed, it’s a good choice for any business on a tight budget. Most people actually pair SSD with their standard HDD to get the best of both worlds. Operating systems and critical applications can be stored in SSD for faster boot times, while regular files can be stored in HDD. Even with this crash course on hard drives and SSDs, you will still probably need a storage professional to help you pick the best device for your business. For all your storage drive queries, installment requirements, and IT maintenance needs, contact our IT consultants today. Although a ransomware infection might feel targeted, you’re not the only one who’s been infected. Ransomware is spreading at an alarming rate, but the further it goes, the more resources are allocated to fighting it. If your data is held hostage, always check these lists for free decryptors first. It’s been almost 30 years since malware was first created that could encrypt locally-stored data and demand money in exchange for its safe return. Known as ransomware, this type of malware has gone through multiple periods of popularity. 2006 and 2013 saw brief spikes in infections, but they’ve never been as bad as they are now. In 2015, the FBI estimated that ransomware attacks cost victims $24 million, but in the first three months of 2016 it had already racked up more than $209 million. At the beginning of 2017, more than 10% of all malware infections were some version of ransomware. Not every type of infection is targeted to individual organizations. Some infections may happen as a result of self-propagating ransomware strains, while others might come from cyber attackers who are hoping targets are so scared that they pay up before doing any research on how dated the strain is. But even when you can get your data back for free, getting hit with malware is no walk in the park. There are essentially three basic approaches to preventing ransomware. First, train your employees about what they should and shouldn’t be opening when browsing the web and checking email. Second, back up your data as often as possible to quarantined storage. As long as access to your backed-up data is extremely limited and not directly connected to your network, you should be able to restore everything in case of an infection. Finally, regularly update all your software solutions (operating systems, productivity software, and antivirus). Most big-name vendors are quick to patch vulnerabilities, and you’ll prevent a large portion of infections just by staying up to date. Whether it’s dealing with an infection or preventing one, the best option is to always seek professional advice from seasoned IT technicians. It’s possible that you could decrypt your data with the tools listed above, but most ransomware strains destroy your data after a set time limit, and you may not be able to beat the clock. If you do, you probably won’t have the expertise to discern where your security was penetrated. Don’t waste time fighting against a never-ending stream of cyber attacks — hand it over to us and be done with it. Call today to find out more. First off, we need to clarify that inventory management systems (IMSs) are not the same as order management systems (OMSs). The former is a solution for analyzing your sales history as a means to forecast demand for your product and the materials you will need in the future, while the latter is all about the here and now. What does an OMS do for you? Your eCommerce store can be connected to your inventory. If something is out of stock, it can be reflected on your site so customers aren’t misled about the availability of your product. Payment authorizations can be automated and integrated with your shipping services. You can provide reports to your customers about their order’s shipping status. From intra-warehouse movements to on-the-truck updates, one page will have all the information they need. Products and materials can be automatically restocked once they dip below a certain threshold. Refund and returns can be automatically processed by your OMS. And like any industry, there are dozens of OMS platforms with niche functionalities that may be better for your specific business model. The most important thing is that you find a solution that decreases the most tedious organizational tasks for tracking your store’s orders. Orders are streaming in at all hours of the day, and you can’t guarantee that you’ll always be in the office when you need to check the status of an order. 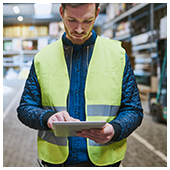 A cloud-based OMS stores all your information in a centralized location so you can access your information from home, the warehouse floor, or even while waiting for takeoff. The cloud is generally one of the most reliable ways to add value to your business. There are dozens of platforms, just like OMSs, that require virtually no hardware and allow you to pay for exactly what you use. For advice on which solutions are best for your business, and how to deploy them, call us today. Calling a piece of software a “firewall” is a bit of an exaggeration. Installing it on a local hard drive is more like locks on a door than impenetrable walls. When data is scanned for threats by a software firewall, the information it contains has already been passed through your router, network switch, and finally your local hard drive. 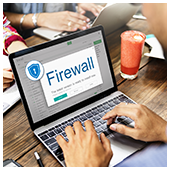 Once the whole cycle has finished, software firewalls can prohibit risky activities based on blacklisted IP addresses, known malware definitions, and suspicious application requests. Although these solutions do have value, they can’t guarantee that malware won’t spread to other systems before each packet of data can be scanned, unless they’re standing guard at your business’s gateway to the internet. And whenever the computer with the firewall is powered off, everything it protects is left unguarded. Because the drawbacks of a software-based firewall are centered around their inefficient network position, a hardware solution is the safer option. Hardware firewalls sit directly behind your router, so every single packet of data coming from the internet must pass through your gatekeeper before landing on any of your internal drives. Most of these solutions include far more sophisticated controls than just web filtering and basic data scanning. 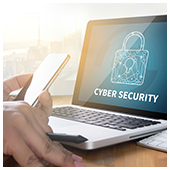 Like most developments in the IT industry, newer hardware firewalls focus on “intelligent” functions that analyze huge datasets to recognize malware and cyberattacks based on irregular activities instead of relying solely on cataloged viruses and attack vectors. Another benefit of hardware firewalls is that they’re always on. There’s no need to worry about whether the workstation hosting your solution will crash because these devices are built for 24/7 protection. The only downside to this type of solution is the level of monitoring and maintenance it requires. Hardware firewalls are extremely complex and managing them is no easy task. The most recent, and undoubtedly best, solution to network perimeter security are “cloud” firewalls. These are on-site pieces of hardware with software interfaces that can be managed remotely by certified security professionals. This service model means that experts will monitor your network performance and security for anomalies while your team goes about its business as usual. No need for onsite tweaks and updates — all of it can be done remotely. You may hear a lot of experts telling you that the age of on-site hardware has passed and everything can be done in the cloud. Remote administration may be the next wave in network services, but the need for hardware will never go away. If you need someone to manage your physical devices, contact us today. Snapchat is a social media application that allows users to send pictures and videos – called “Snaps” – to others. The media sent can only be viewed for 10 seconds or less (you can specify the length), after which it disappears for good. You can add a Snap or multiple Snaps to create your own “story” which can be viewed by others for 24 hours. Unlike other social networks like Twitter and Instagram, hashtags don’t suffice when you want to get your audience’s attention. They have to find and add you – not the other way around. Even if you want to add other users so they could add you back, you can’t base the search on vague terms — you have to know their Snapchat username to add them. Basically, Snapchat has no native discovery features. Promote your username in your social media profiles – promote your Snapchat username by posting it in other profiles to encourage people to add you. You can also share your username in email signatures, blog posts, and even your company website. Share relevant content – plan an interesting series of Snaps to share with your followers and post all the details on other social media accounts along with your username and/or QR code image, this gives followers an incentive to connect with your brand. Snapcode image as your profile picture on other social networks – take a screenshot and crop your Snapchat QR code image (Snapcode) and set that as a profile picture on your other social media accounts. Anyone who points their Snapchat camera at the code will automatically add you to their friends list. Snapchat is one of the newest social media outlets to date. If you start building your brand on it now, you’ll be taking a huge step ahead of your competitors – especially now that Snapchat is catching up to Facebook and other social media giants. 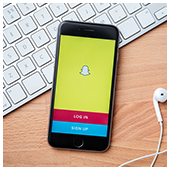 If you would like to know more about what Snapchat can do for your small- and medium-sized business, feel free to give us a call! Fileless malware: who are the targets? What is this new threat? To oversimplify the matter, fileless malware is stored somewhere other than a hard drive. For example, with some incredibly talented programming, a piece of malware could be stored in your Random Access Memory (RAM). RAM is a type of temporary memory used only by applications that are running, which means antivirus software never scans it on account of its temporary nature. This makes fileless malware incredibly hard to detect. Industry-leading cyber security firm Kaspersky Lab first discovered a type of fileless malware on its very own network almost two years ago. The final verdict was that it originated from the Stuxnet strain of state-sponsored cyber warfare. The high level of sophistication and government funding meant fileless malware was virtually nonexistent until the beginning of 2017. Apparently being infected by this strain of malware makes you an expert because Kaspersky Lab was the group that uncovered over 140 infections across 40 different countries. Almost every instance of the fileless malware was found in financial institutions and worked towards obtaining login credentials. In the worst cases, infections had already gleaned enough information to allow cyber attackers to withdraw undisclosed sums of cash from ATMs. It is extremely unlikely your business would have been targeted in the earliest stages of this particular strain of malware. Whoever created this program is after cold hard cash. Not ransoms, not valuable data, and not destruction. Unless your network directly handles the transfer of cash assets, you’re fine. If you want to be extra careful, employ solutions that analyze trends in behavior. When hackers acquire login information, they usually test it out at odd hours and any intrusion prevention system should be able to recognize the attempt as dubious. Should I worry about the future? The answer is a bit of a mixed bag. Cybersecurity requires constant attention and education, but it’s not something you can just jump into. What you should do is hire a managed services provider that promises 24/7 network monitoring and up-to-the-minute patches and software updates — like us. Call today to get started.